In hindsight I can look back and see I have liked a few sea battle sub games. Starting with sub hunt on the intellivision and Silent Service on the Atari 8 bit. But it wasn't until 688 Attack Sub that I really got into it. Playing it on my 286 with EGA. Playing hunter killer with a friend over the modem. Tying up the phone line for hours at a time. I had vivid memories of touring a sub down in Battleship Park in Alabama where the Battleship Alabama is a floating museum. I guess the 3D simulated underground landscape had me mesmerized. 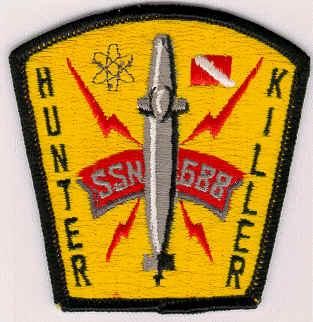 And since I bought the first edition of the game I am the proud owner of the 688 Hunter Killer patch that came with the game.